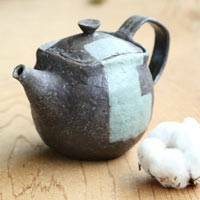 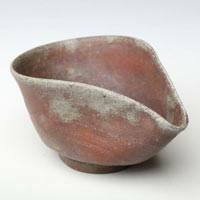 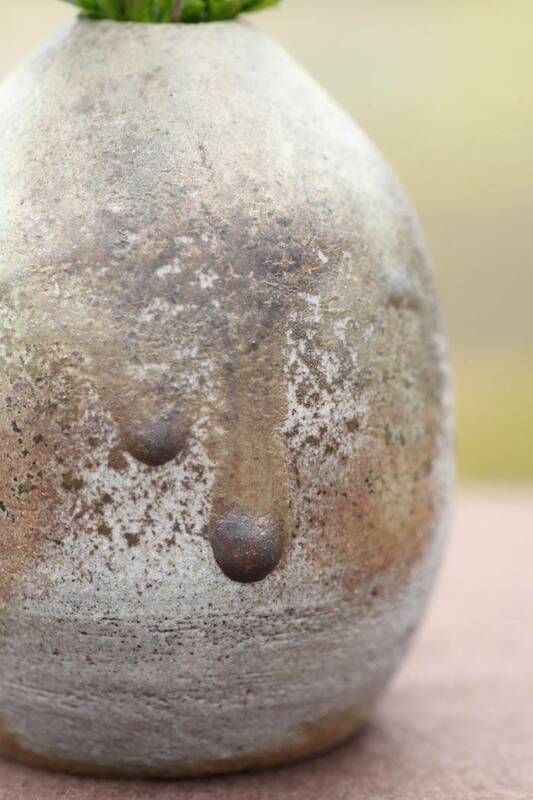 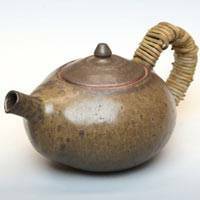 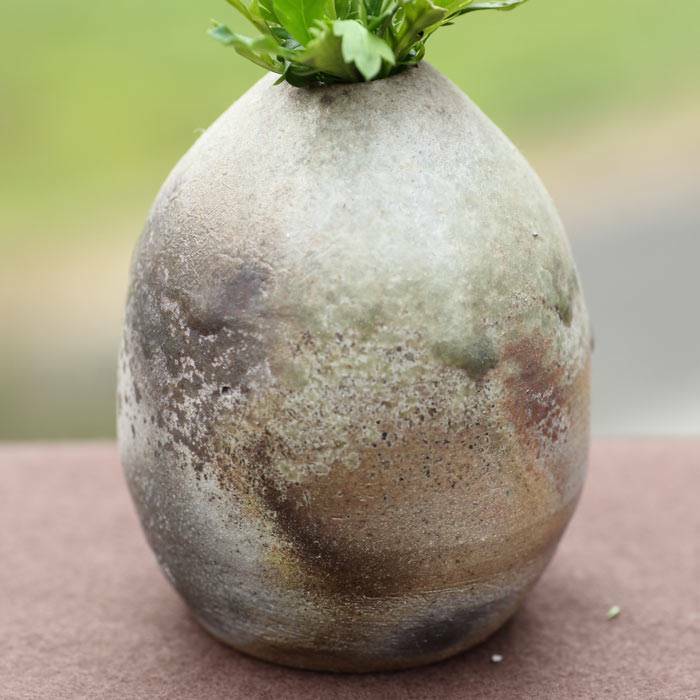 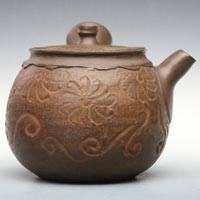 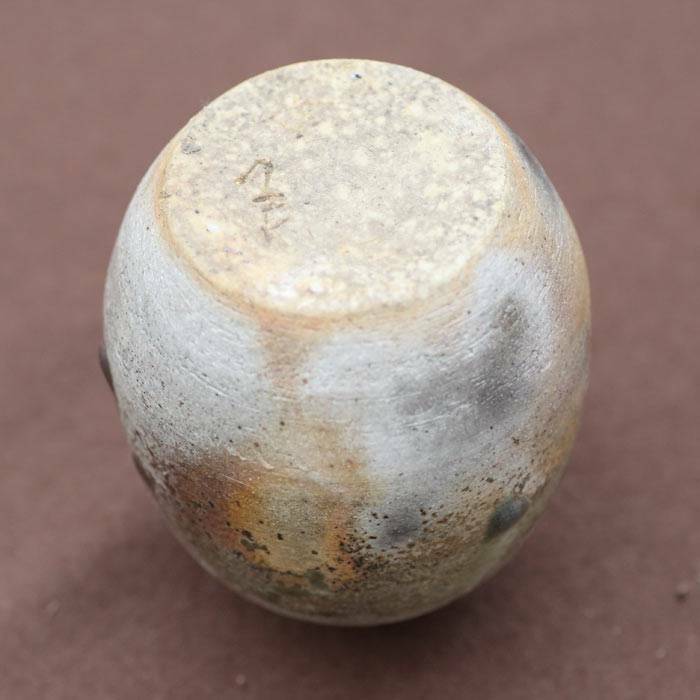 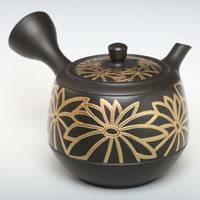 The beauty of Bizen-yaki – Bizen ware – lies in the essence of clay itself: Over the course of two long weeks in a wood-fired kiln, unique discolorations and patterns of patina, known as yōhen, appear on the surface of each piece without any help from glaze. 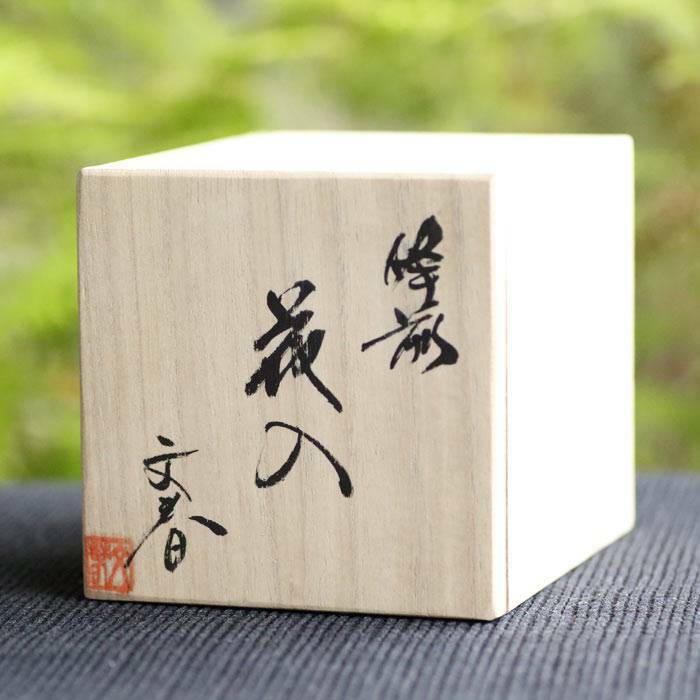 One such yōhen, known as sangiri, is Fumiharu Kino’s calling card. 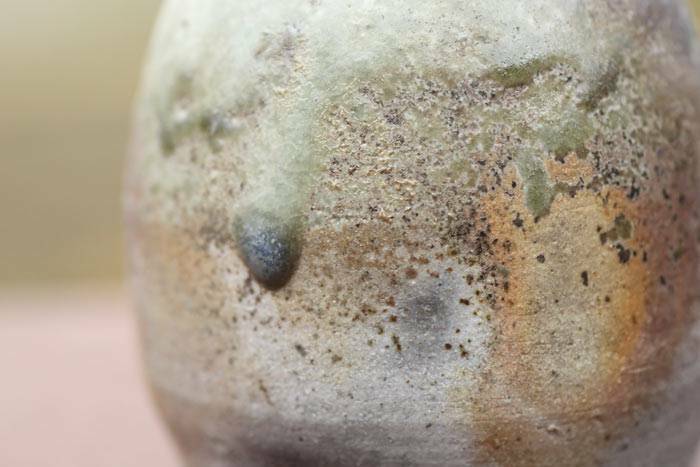 These pieces exhibit brilliant spots of white and yellow, produced when charcoal is added to the kiln. 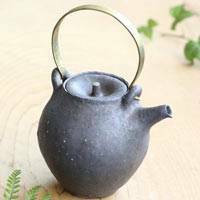 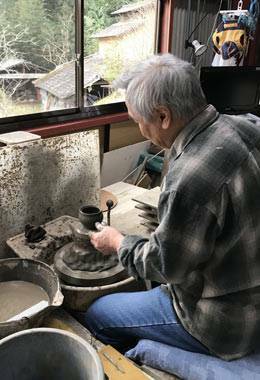 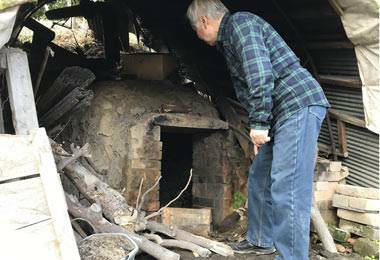 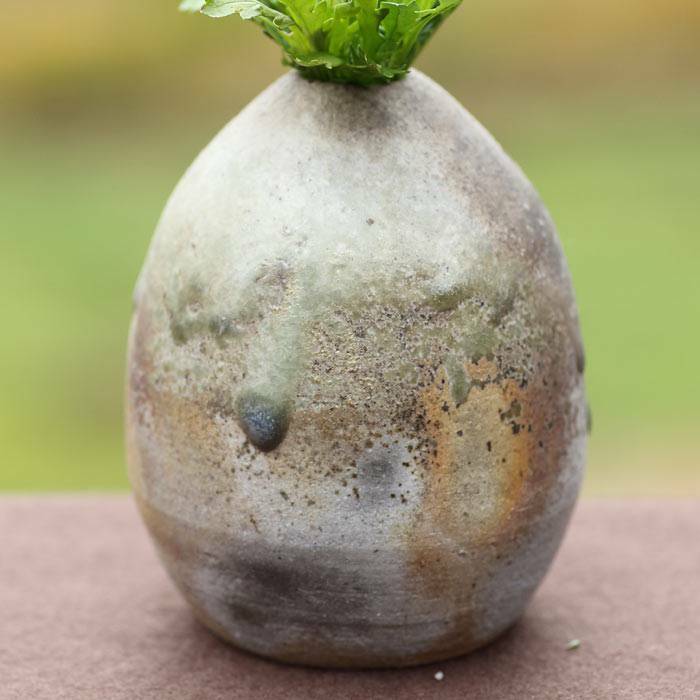 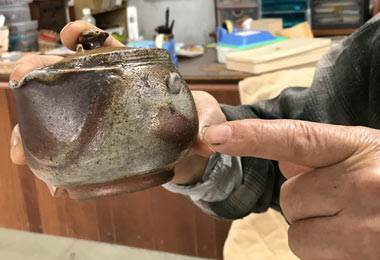 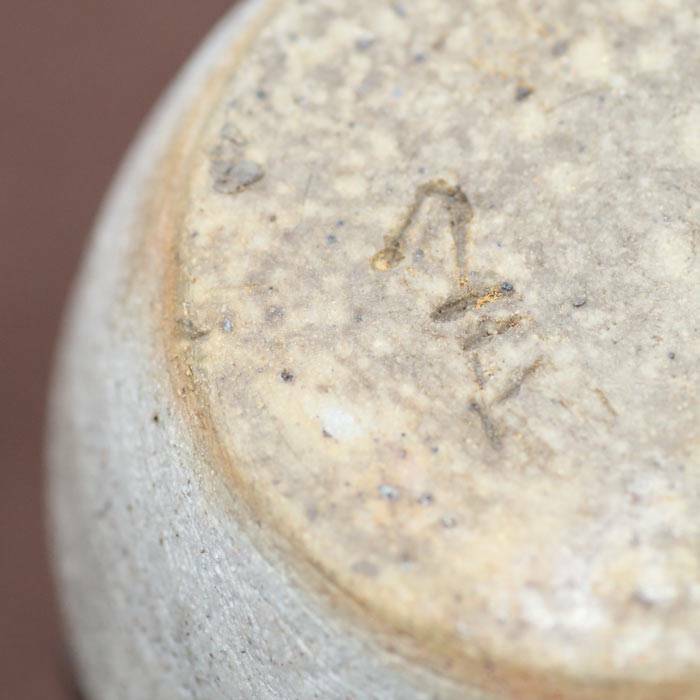 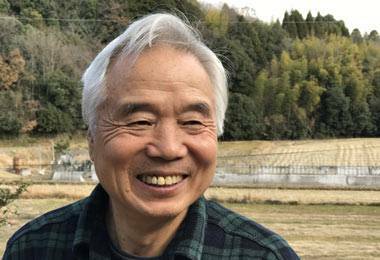 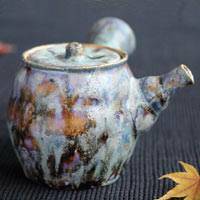 “I might be about the only Bizen-ware artisan to make charcoal myself,” Kino says. 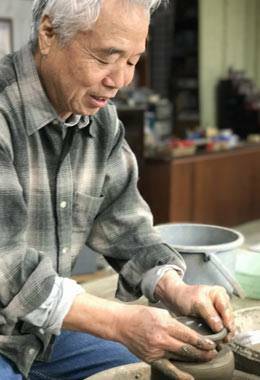 How and whether the sangiri effect appears on each work depends on how much charcoal reacts with each piece, making the pieces that do bear it richly expressive. 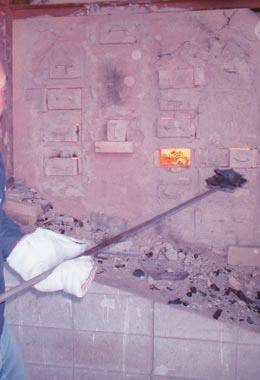 Kino has also altered his kiln to encourage the sangiri effect to appear more often, installing more slots where charcoal can be inserted. 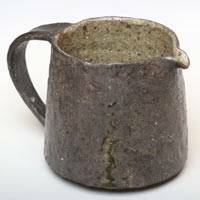 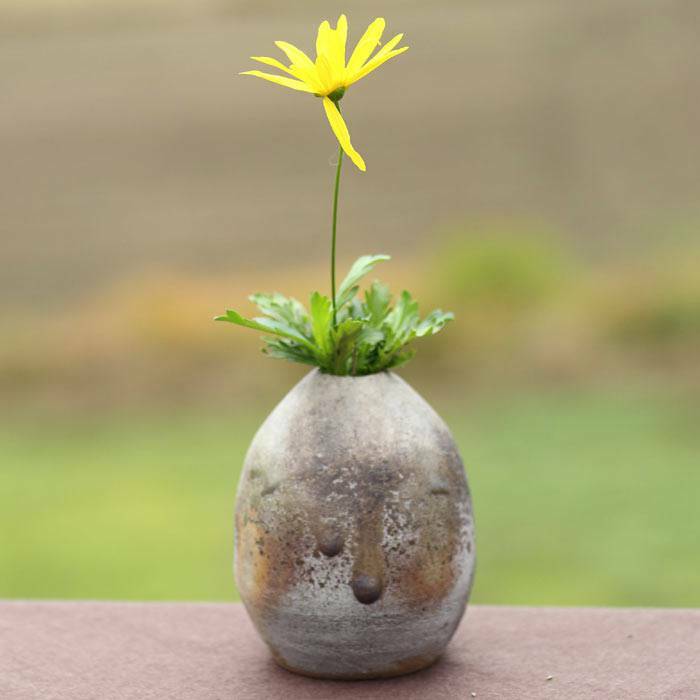 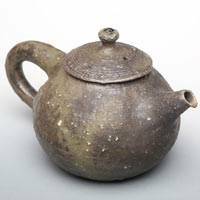 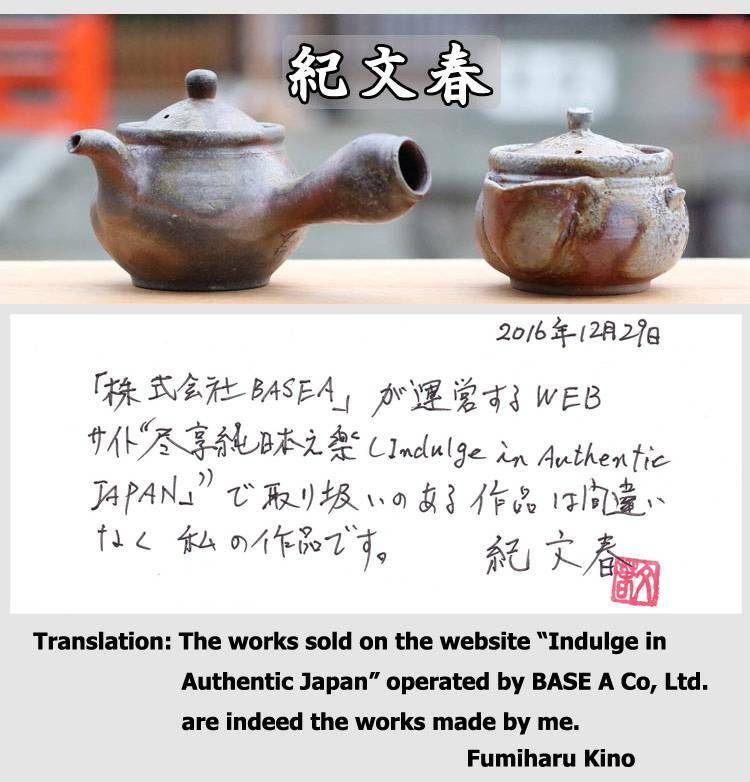 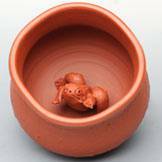 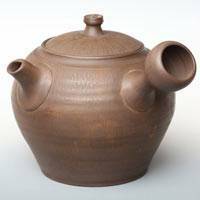 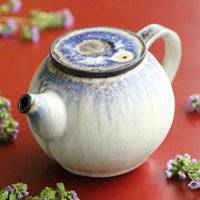 Kino was born in 1951 to a happy home near the Imbe section of Bizen, Okayama – the home of Bizen-ware. 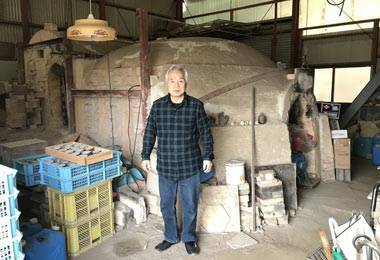 He toiled as an ordinary office-worker for six years after graduating high school. 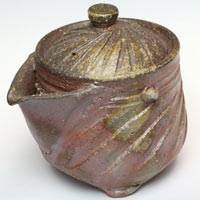 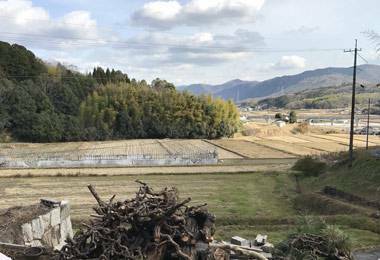 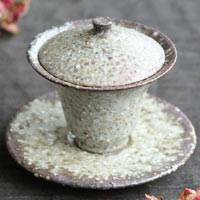 But at the age of 24, he began working at the Bisyugama workshop under Tōshū Yamamoto, a relative of his wife who would later be named a Living National Treasure of Japan. 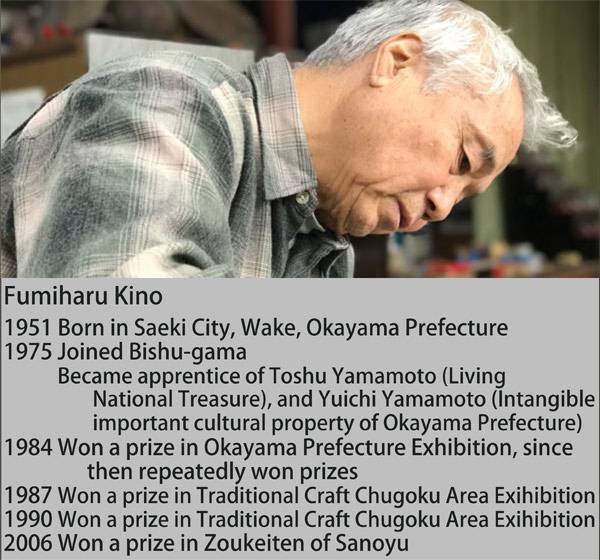 Kino studied under Yamamoto – and then his son Yuichi Yamamoto, later named an important intangible cultural property of Okayama Prefecture – for 20 years.